Samuel Beckett is often misconstrued as writing inaccessible, absurd theatre with unconventional structures, intangible plots and bleak, sordid characters. Contrary to this, his ability to discard the trappings and complications which make up much of our literature and lay bare the most essential aspects of the human condition is both comic and cathartic. Angel Theatre Company offers two of his short, later plays, ‘Footfalls’ and ‘Play’, both of which are perfect examples of Beckett’s most musical orchestration of scripts, full of technical precision and producing dramatic aural imagery. In ‘Play’ the scene is set to a background of chattering. 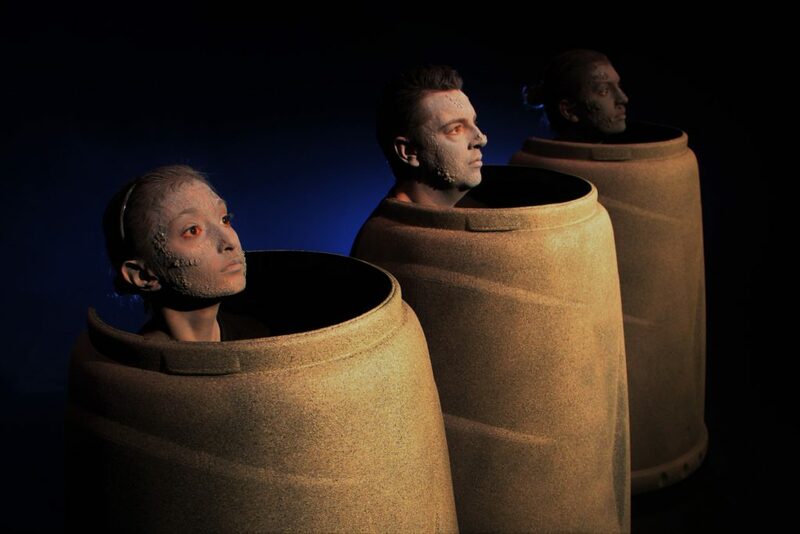 Three large urns hold the visible heads of Man, Woman 1 (his wife) and Woman 2 (his mistress); the agelessness, indicated by Beckett, suggest souls in purgatory. Written separately and later interspersed, the three tell their story in short, often fragmented sentences and pauses at a rapid speed while lit by a spotlight which moves directly from one to another. Stage directions specify tempo, tone and volume, even a ‘da capo’ and brief coda. Sometimes appearing as victims of the light, each reacts differently to the sense of interrogation. Rose Trustman as Woman 1, shows the strong, fighting spirit of the wife but doesn’t know how to satisfy the light, telling it to ‘get off her’. Samantha Kamras portrays Woman 2 with a calm confidence, increasingly losing her poise when the light is on her and asking if she is not becoming ‘unhinged’. Ricky Zalman neatly defines the witty quality of Man’s wandering imagination as he speaks. Although the initial soundtrack and face makeup is significantly similar to Minghella’s 2001 film, John Patterson directs with immaculate precision and we are immediately caught up in the intrigue of this love triangle, devoid of stereotypical melodrama and romanticised fiction. The muted yet detailed noises in ‘Footfalls’ – the bell punctuating the four parts, the pacing of May and the sound of speech – paint a softly poignant and personal picture but the play also brushes the wider question of existence. May, dressed in a dishevelled nightdress, is trapped in a moment in time, which she replays repeatedly as she paces slowly up and down, endlessly revolving something in her mind. She converses with her mother, normally an off-stage voice but in this case played by Pearl Marsland as a haunting, maternal face in the doorway, watching her daughter. In a deeply moving performance from Anna Bonnett, we feel May’s isolation and suffering in her tormented thoughts, her mind gradually fading with her presence on stage. In the two plays, Oliver Fretz’s lighting is impeccable in mood and movement. The company conveys a rapport which absorbs us into the worlds of these relationships, linked by their raw nature but different in mood and manner. Beckett pares his later works to the extreme, wasting no words and here we are compelled to hang on to his every one.